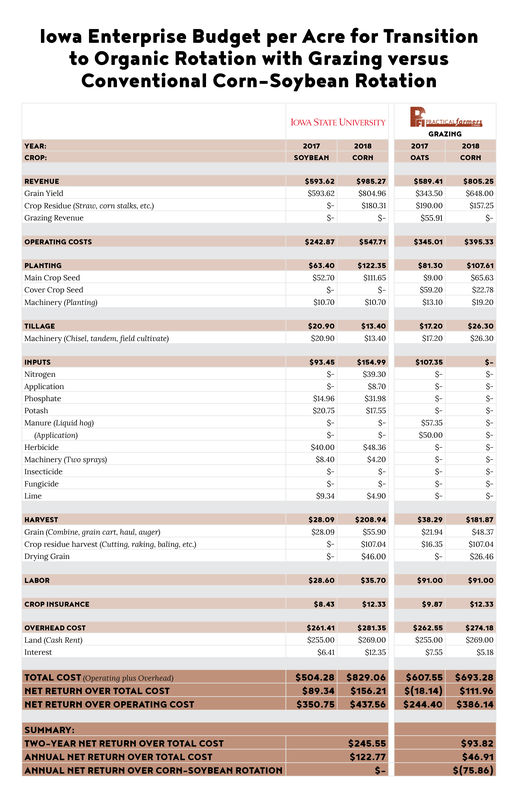 Transitioning to organic requires forethought and planning in order to keep a farm business solvent through the three years where crop production complies with organic standards (no pesticides, synthetic fertilizers nor genetically modified seeds used) while organic premium prices are not accessible. Even though these three years can be managed easily so that only two crops have to be marketed as conventional while following organic production standards, generally speaking, without conventional production practices yields of staple crops such as corn and soybeans are lower, purchasing organic-compliant fertilizer (usually poultry manure) is costlier and the learning curve is steep for organic production practices such as weed control. 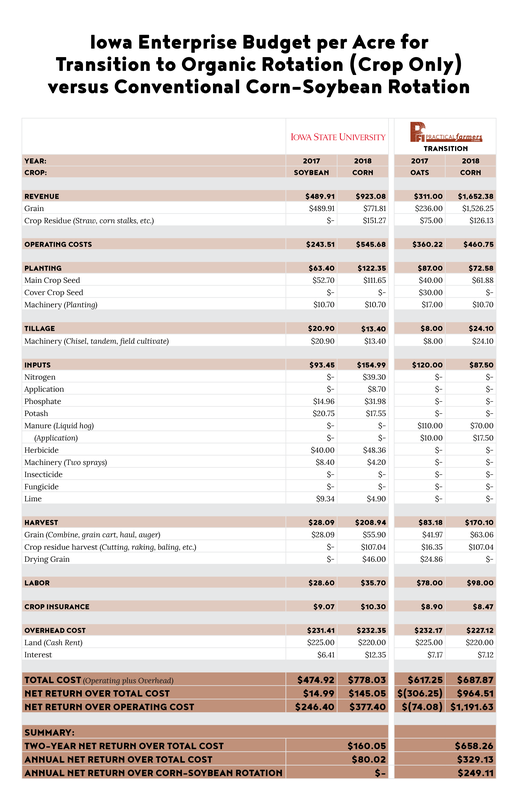 One strategy farmers might consider using in order to make ends meet during these transition years is to grow lower-input crops such as small grains in order to keep their expenses in line with their revenues. Some farmers tested this theory with Practical Farmers’ small grain cost share and provided economic data to us to inform enterprise budgets for oat-corn rotation during the organic transition phase. The following blog will review some of the dos and don’ts that they gleaned from this process. It is important to frame these budgets within their context in the rotation. 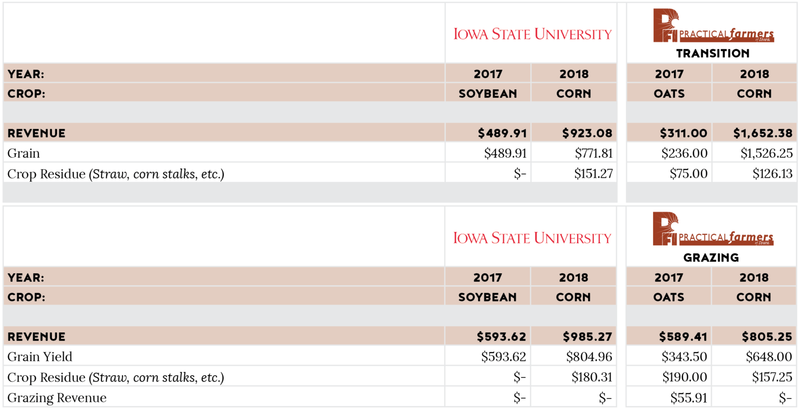 Both of these budgets represent the first two years of a rotation in transition – when budgeting is particularly difficult because management costs exceed income from conventional crop prices. In the third year the crop can be sold for an organic premium which brings production expenses in line with revenue. So these two years are the leanest times due to the lowest revenues. For this, reason, producers often transition acres gradually as researchers at ISU demonstrate in their Ag Decision Maker transition budget (see table below). This example provides a valuable benchmark to show what a “normal” transition budget looks like. The two budgets we have collated represent two different management systems. The first is a crop-only budget which used a co-seeding of oats and red clover in 2017 and followed it with corn in 2018. Straw was harvested from the small grain in small square bales and corn stalks were also baled in large round bales. Poultry litter was used for fertility in the fall of 2016 and 2017 to provide nutrients for both crops and tillage was the primary form of weed control. This budget contains one pass of tillage before oats, two passes of pre-planting tillage before corn and two passes of in-row cultivation during the corn growing season to manage weeds. Oats were dried on-farm but the corn was not. The oats were sold for $2.95 per bushel. Corn grain yielded 165 bushels per acre and was sold into the Non-GMO premium market for $9.25 per bushel. This budget is referred to as transition rotation in this blog. The second system is managed with livestock grazing integrated into the system. 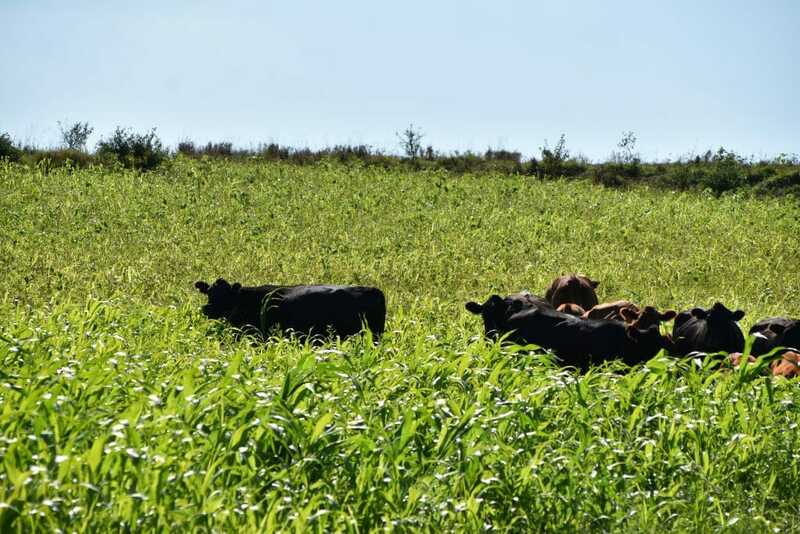 As in the first budget oats were grown in 2017 and corn in 2018, however, the cover crop was a diverse 13-way cover crop mix designed for nutritious and abundant forage potential. This cover crop was seeded in August after small grain harvest and was grazed by both sheep and cattle. Oats were not dried using a drying system but corn was. Corn and oats were harvested for grain and sold for $3.90 per bushel and $3 per bushel respectively and straw and corn stalks were baled as small square bales. Corn yielded 180 bushels per acre. Tillage was used in both years of the rotation and manure was applied in the oat year only. This rotation is referred to as grazing rotation in this blog. In the revenue section the differences in corn revenues are stark. Yields in the transition rotation were the lowest at 165 bushels/acre but the revenue was highest because the grain was sold at a premium for Non-GMO markets. The comparable conventional county corn average was 186 bushels per acre, so the Non-GMO market allowed increased income despite lower yields. The grazing rotation, by contrast, shows lower revenues for corn because yields were 180 bushels per acre and paid at the same conventional price as the conventional rotation which yielded the county average of 211 bushels per acre. 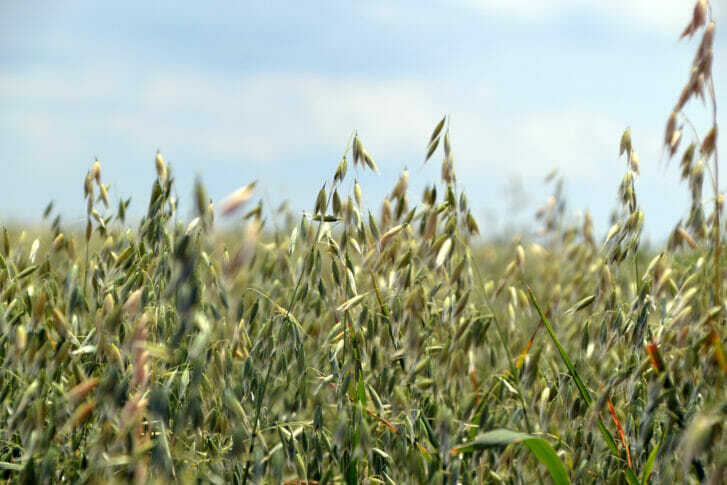 Organic production standards require use of Non-GMO seed stock during the transition phase so every transitional producer could sell the grain at this premium – if a nearby market is available. Randy and Willie Hughes operate a family farm with conventional and organic production on 4,700 acres. They insist on “marketing the heck out of their grains” to keep revenues high enough to cover the costs of organic production practices. Transportation costs to markets are not included in any of the budgets so these would be subtracted directly from the net profit numbers and therefore may be more feasible for some growers than others depending on their market opportunities. Another number that jumps out immediately when inspecting these budgets is that the oat year is in the negative for both the transition (-$306) and grazing (-$18) budgets. “It takes a lot of money to transition,” Caleb Akin, who farms transitional ground with his farm partner Noah Wendt near Huxley, says, “because generally you’re running a negative cash flow for the three [transition] years,” Though through managing the timing of the last spray on a field going into transition, this can be shortened to two years. The negative cash flow in the oat year is somewhat due to the difficulty of properly assigning expenses to their related crop benefit. For both transitional budgets the manure and cover crop expenses are listed in the 2017 oat year; however, the nitrogen they provide is directly supporting the corn production in the following year of the rotation which has positive revenue in both budgets, more than enough to cover the losses of the oat year. So it is important in any transition planning or accounting to look at revenues across the entire rotation and farm where other crops and production phases (conventional or organic) can offset losses in the transitional field. These two budgets represent very different approaches to maintaining corn yields. The grazing budget limits manure inputs to the system and capitalizes on the cover crop in the oat year through grazing. This increases the revenue in this year of production and good underlying soil conditions are able to produce 186 bushel/acre yields (-25 bushel per acre less than county average) with low manure expenses for less-nutrient rich and comparatively easy to apply liquid hog manure and a cover crop designed to feed livestock rather than produce nitrogen. This leads to controlled deficits in any one year of the budget, but lower revenues over the combined years of the rotation, so average annual net return over both years of the rotation is $47 – nearly $76 lower than the average two-year return of the conventional rotation of $122 per acre per year. The transition farm, on the other hand, demonstrates a strategy when underlying soil conditions don’t allow for good yields with limited inputs or when farm financing can operate at a loss for one year. In the oat phase no income is generated off of the cover crop, a solid seeding of clover, which can then provide maximum nitrogen to the following year of corn. Costlier, nutrient-dense poultry litter is purchased off-farm and transported to the farm and then applied which incurs additional cost for the manure itself as well as the labor and equipment expense of applying solid manure. This approach to managing the oat year puts many expenses in that calendar year with lower income leading to poor net returns. 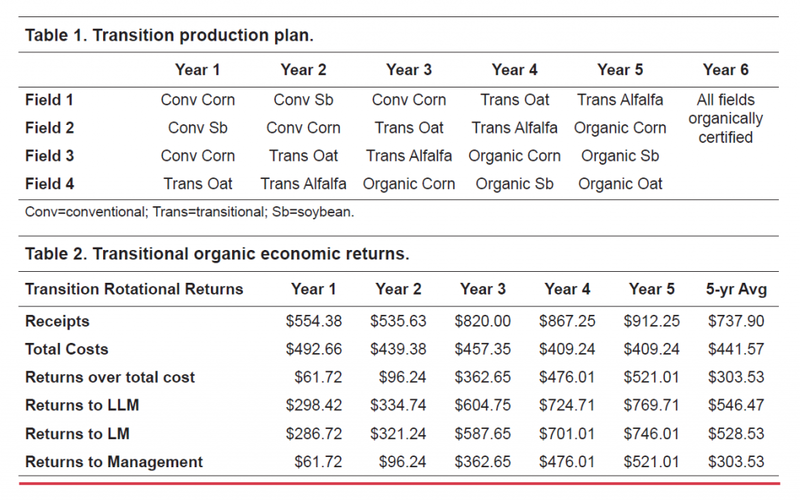 But, the returns on the corn in the following year, sold at the Non-GMO price are more than enough to bring the average net returns across the two years to an impressive $329 per acre — $249 more than the conventional average annual net return of $80. The cover crop expenses are one area of difference between the transition and grazing budgets. The transition budget has cover crop seed cost for a solid planting of red clover of $30 per acre and the grazing system’s more diverse cover crop mix designed for grazing costs $59.20 per acre. Additionally, a summer-planted after small grain harvest is also riskier as moisture can be scarce in August leading to poor cover crop establishment and therefore forage potential for grazing. In the grazing budget example, poor establishment probably limited the revenue from grazing ($55 per acre) which during a normal year might have fed more livestock for a longer period of time. For this model, the value of grazing is generated using the cover crop grazing calculator – referencing the avoided costs of stored feeds that would have had to be fed without a growing cover crop as a forage source. The expense of a grazing summer-planted mix should be weighed carefully against potential revenue from grazing. Frost-seeding a clover in the early spring is nearly fool-proof for establishment so this cover crop strategy is therefore both less risky and, because it’s a single species, it’s also less expensive. Managing weeds is one of the biggest challenges due to cost and windows of opportunity in organic crop production; comparatively chemical pesticide reliance is a single recipe that can be applied during a longer window of time. Scott Shriver is a long-time organic farmer continues to pick up and transition fields to organic near Jefferson. “I do think timing is crucial early cultivation getting those weeds when they’re not even emerged, they’ve just germinated and they’re in that white root hair stage,” he says. “That all sounds good, and then again Mother Nature comes along and you don’t get into the field until two weeks after you plant.” Due to these limited management windows in organic production, weed control should rely on crop rotation, cover crop management for weed control, tillage and hand weeding. Cool-season plants like small grains and cover crops suppress weeds over winter, providing important cultural control of weeds and lower expenses of management operations like tillage and hand-weeding. Tillage is used in the conventional rotation comparisons as well as both transitional budgets – however, the type of tillage varies. The transitional rotations use primary tillage before planting as well as cultivation in-season in the corn. The transition system relies on oats co-seeded with clover as a continuous year of living cover for weed control and then in the spring before corn two passes of tillage are conducted before planting and 2 passes of in-season cultivation bringing tillage expense to $24.10 per acre. The grazing rotation, does not use a cover crop with as much weed-suppression potential because it is planted after oat harvest and is a winter-kill variety that won’t grow late into the fall. Perhaps because of this or as part of the learning process with weed management in an organic system this farm shows six passes of tillage but lighter operations of dragging or harrowing or rotary hoeing. This creates about an equal expense of $26.30 per acre but also provides an area of opportunity to cut expense even further by cutting passes through improved weed control over time.